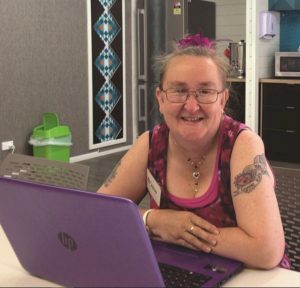 “A mama on the move” Debbie Broadmore started with a very limited knowledge (watching her children browse the internet with their phones) but now creates digital signage for the Op-shop she volunteers at. While we await reinstated funding announced in the Coalition Agreement, we continue our series of Computers in Homes stories. Debbie Broadmore is a Mum with two teenage children living in Whakatane. She volunteers at the Whakatane SPCA Op Shop and is very enthusiastic when it comes to helping out in the community. 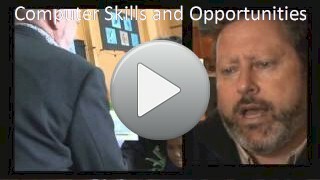 The thought of even beginning the Computers in Homes programme was terrifying to her. Debbie believed her very limited knowledge of computers would be a barrier to learning and participating within the learning environment. Will I hold back the others? 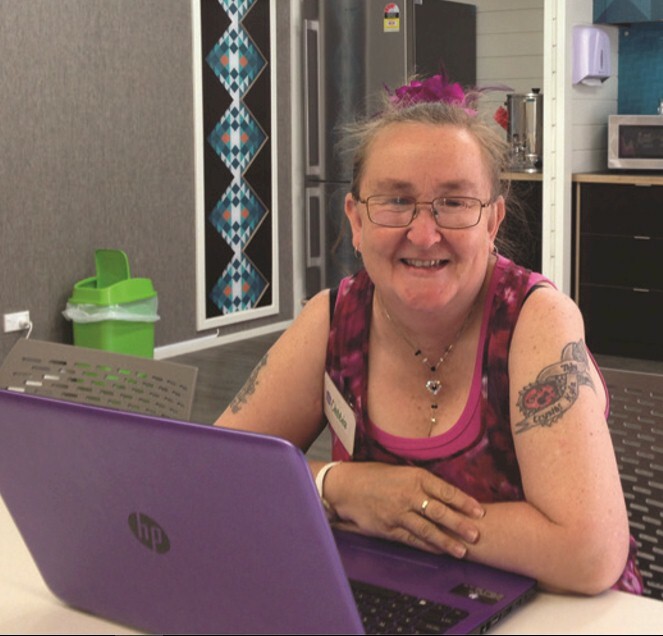 Before joining the Computers in Homes class, Debbie’s mind was racing with thoughts of being a hindrance to the learning group, and that this type of learning was well out of reach for her. She had never been in a classroom learning environment as an adult, let alone in a class with a group of 10 people of all ages, with different levels of knowledge and needs. However, Debbie had a little knowledge of the digital world her teenage children lived in, and she knew it was important to have a computer and internet access available at home for them. Her children were regular visitors to the local library to access their digital resources. In her world of volunteering, Debbie had not recognised that digital skills would help her to be more efficient and valuable in her work. But according to Debbie, life after the programme has taken an exciting turn. The family is now in more regular contact with other members living afar; her children are continuously accessing the internet for homework and social media. For herself, Debbie is now able to create digital signs instead of hand written pricing for work. She can now use the internet to locate goods, whereas in the past she would have used the phone. She sources goods that are available by donation on local websites and social media. Debbie uses a “do it yourself” website that helps her create the fancy signage in her workplace. Her confidence and abilities to achieve in life and complete tasks that were once thought impossible have certainly put a smile on her dial.